Sometimes, a historical film can be purely an exercise in studying the past. Other times, someone can use the events of the past to draw parallels to the present, making them more about today than yesterday. Bridge of Spies is somewhere in the middle of these two types. The first half is clearly and as open an allegory about the "War on Terror" as it is about the Cold War to where, if the filmmakers were honest, they would have just substituted "jihadist" for "Communist" to make it even more abundantly clear where they stood on issues like due process for terrorists and Gitmo. The second half, however, plays it more straightforward, as if we got the message out of the way to get into a different story (though still with political overtones). Part of my coldness towards Bridge of Spies comes from the former, using the Cold War as a thinly-veiled effort to show how the stack is against those who for some reason are seen as a threat to the country based solely on their efforts to exterminate us...a very thinly-veiled effort. However, once we get the allegory out of the way, Bridge of Spies becomes more conventional and more interesting. James B. Donovan (Tom Hanks), insurance attorney, is given a new assignment: defending Rudolf Abel (Mark Rylance), a seemingly harmless man who has been arrested for being a Soviet Communist spy. Donovan doesn't want to gig and is genuinely puzzled as to why he was selected, but being the moral upright Constitution-loving lawyer that he is, mounts a defense for Abel. No one in 1950s America wants to see this spy defended as he is an evil man who wants to destroy America with THE Bomb, but Donovan, wisest of all men, knows that America is simply better than this, and that all men in the States, even enemy combatants, deserve their day in court and the best defense possible. Donovan gets hate mail and his home at one time is shot at, nearly killing his daughter (and some of the beat cops aren't thrilled to be protecting the home of the man who champions Abel). Eventually, despite losing in the first trial, Donovan continues his one-man moral mission, down to taking it to the Supreme Court. While again he loses, Donovan does get a small victory of sorts when Abel is sentenced to 20 years rather than death, the lawyer suggesting that Abel may serve a purpose in the future. That future comes in the U2 Incident, when Francis Gary Powers (Austin Stowell), American pilot recently recruited by the CIA to photograph Soviet installations, is shot down over Soviet airspace, placed on trial, and sentenced (as well as tortured for information). Donovan is contacted to be the contact man in backroom negotiations for an exchange: Abel for Powers. It's off to East Berlin to begin the officially unofficial talks between the U.S. and the U.S.S.R.
Then enters a new complication. American economics student Fredric Pryor (Will Rogers) tried to get his East Berlin girlfriend and professor father out of East Berlin but ended up trapped there as the Berlin Wall was being built. Not just that, but Pryor too is being tortured by the East Germans. When he arrives in East Berlin, Donovan is told of Pryor's situation, and he wants to get him in the exchange too. However, the CIA is interested only in Powers, and while he's given permission to try for Pryor, it's made clear the student is not a priority (except for the upright Donovan). Donovan finds negotiating between the Soviets and the East Germans rather difficult, their petty territorialism irritating him and making things harder. Waiting in all this is Abel, who might be able to return home. Eventually, Donovan negotiates a successful exchange to take place on the Glienicke Bridge (hence, Bridge of Spies). The East Germans throw a fit when they hear Donovan went to the Russians for Pryor and won't turn him over. Donovan faces stiff opposition from the CIA, livid that Powers' return might be in jeopardy. Donovan for his turn is irritated by the East German obstruction, and coolly suggests that if Abel is brought to East Berlin only to be returned due to their petty hurt feelings, Abel, who has maintained his silence, might finally talk, and that the Russians might not be pleased by this turnaround. That is enough to bring Powers AND Pryor to freedom. In a post-script, we discover that Donovan continues negotiating with the Soviets, of particular note for prisoners in the Bay of Pigs incident. There is something within me that instantly rebels against being lectured to in a film, even when I agree with the lecturer. Bridge of Spies struck me as such a lecture, at least for the first half of the film. All the talk about enemies caught in the United States deserving a fair trial and due process and the open antagonism of the judge and the public against the idea that even spies like Abel should be put on trial rather than summarily executed, in my view, was as open a call to support those accused of terrorist acts today. The film, to me, used Abel as a symbol for people like the late Osama bin Laden of unhappy memory. Rather than being merely shot in the raid portrayed in Zero Dark Thirty, I could not shake the belief while watching Bridge of Spies that those involved in the film would rather have had someone like bin Laden had his day in court. Perhaps it is how Donovan angrily dismisses the CIA's idea that he violate attorney-client privilege to help them against Abel (whom Donovan constantly points out has been nothing more than 'a good soldier' for his side). Perhaps it is the open hostility of the beat cop who launches into Donovan after his home was shot at by questioning Donovan's desire to defend Abel (to me reminiscent of a New York City cop going after someone defending Khalid Sheik Mohammed). Perhaps it is Donovan's stirring defense of the idea of protecting all people's rights in the U.S. before the Supreme Court. Perhaps it is the idea that Powers and the CIA were flying the 1950s version of drones over the enemy. However, throughout the first half the idea of allegory, of using the Cold War to draw parallels to today was something I could not shake. That isn't to say that I oppose/support giving spies/terrorists their day in court. It is merely the idea that I'm not convinced that such parallels were necessary. It also to me made me wonder whether a bit too much time was taken up with the Abel case because to me, it looked like we got two movies put together: the Abel case and the Powers/Pryor situation. Could there have been a better way to put these two together? However, there was a lot to recommend. Of particular note is Rylance as Abel, who makes Abel into a sympathetic character. His casual comment "Would it help?" at many situations shows a somewhat detached manner to Abel, but it also made things wryly amusing. He steals every scene he is, and when he goes across the bridge we get the sense that he won't get rewarded for being loyal to the State. As a side note, the scene when Donovan meets Abel's 'family' is amusing and made me wonder whether they were in fact related to Abel. Hanks is his solid self as the typical All-American figure he does so well, the upright citizen who sees things through. I can't fault him for being good at his job, and bringing a touch of humor too (such as when he makes a call to his wife pretending he is 'fishing' in London). One thing I didn't care for was Thomas Newman's score (having taken over for an ill John Williams, Steven Spielberg's usual collaborator). I'm not fond of hearing what is suppose to be 'stirring' music at 'stirring' scenes, punctuating things too much. Oh yes, Spielberg. The man's a craftsman, and Bridge of Spies is on the whole pretty straightforward in terms of how the film moves. 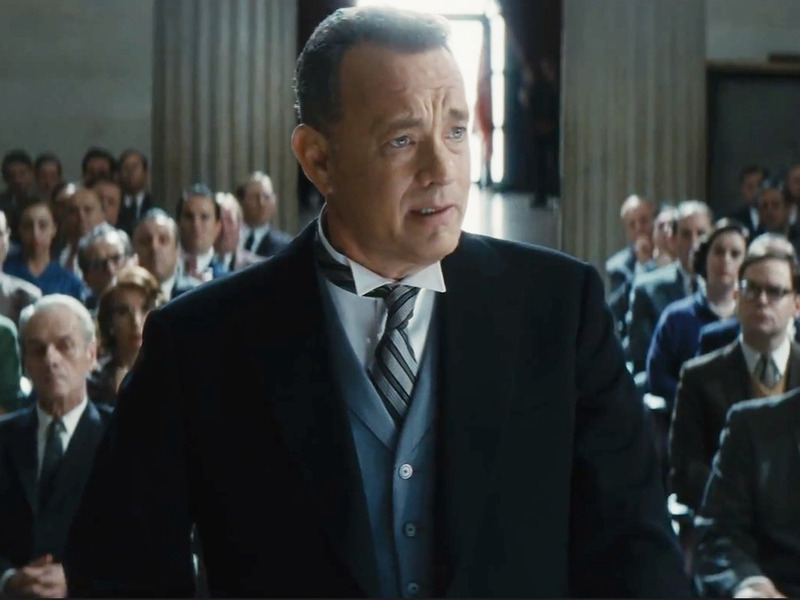 For myself, I can admire, like, and respect Bridge of Spies, but I can't go crazy for it. Again, part of it is the somewhat heavy-handed nature of the symbolism (intentional or not), and part of it was the idea that it was a mix of two films. Still, it was well-made, well-acted (particularly by Rylance) and an interesting tour of Cold War real politick. I saw parallels between then and now, and whether others do or not I cannot say. For me, they were there. For others, perhaps not. Again, whether they were intentional or not I cannot say. I can say Bridge of Spies is worth crossing.